Paducah’s downtown is a key part of the allure for visitors and for local residents. Not only will you find distinctive buildings, lively streets, and architecture of historical significance, but also memorable shopping and dining experiences from locally-owned retail businesses to fine dining restaurants serving fresh, local food and wines. Overlooking the banks of the Ohio River, Paducah is a town proud of its river heritage and cultural diversity that fully embraces the arts. Visit Paducah Main Street to learn more about the historic downtown area. LowerTown is one of Paducah’s oldest and historic residential neighborhoods. In 1836, the Kentucky State Legislature passed an amendatory act which annexed to Paducah an area from Jefferson Street to Clay Street from the Ohio River to 9th Street. This addition was called “LowerTown” because it was downstream from Paducah’s commercial area. The prevalent architectural styles of the neighborhood are Victorian-era designs, with a great variety that includes Queen Anne, Romanesque, Italianate, Gothic and some excellent examples of folk Victorian. 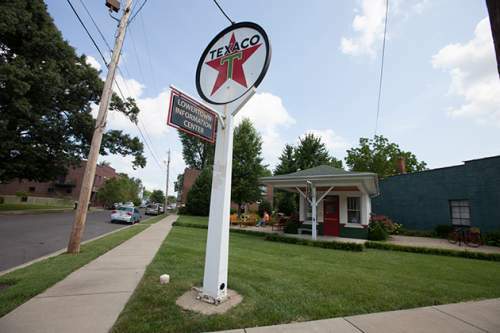 In 1982, the neighborhood was recognized by the federal government for its historical and architectural significance and listed in the National Register for Historic Places and concerned citizens and the City of Paducah took action for its preservation and restoration. The LowerTown Arts District began with the thought to bring artists to the nearly forgotten neighborhood. The artists came in numbers beyond anyone’s expectations; old homes were restored and new ones were built. Soon what had been an undesirable place to live became desirable with beautiful homes and busy galleries. Visit Paducah Main Street to learn more about LowerTown and the many galleries.